It’s now widely known that Roundup has been found to be a probable carcinogen by the World Health Organization. (We wrote about that here: WHO – Roundup Probably Carcinogenic). This is particularly disturbing, because it’s a very widely-used pesticide and the amounts found in humans have increased 5x since 1994 according to a UCSD study. Not only is it used in agriculture, it’s (still) used in our parks. Marin County has prohibited its use on public properties, but San Francisco’s Department of the Environment only reclassified it from Tier II (More Hazardous) to Tier I (Most Hazardous). The Natural Resources Department (NRD) of San Francisco Recreation and Parks Dept (SFRPD) continues to use it. It’s very likely to also be an endocrine disrupter, which means it acts like a hormone in the human body, and can be a problem at very low doses. In Argentina, glyphosate (the active ingredient of Roundup) is widely used on soybean. In soybean-growing areas, there were reports of increased birth defects of a particular type: malformed heads, eyes, and brains. A groups of researchers therefore decided to investigate whether glyphosate could indeed cause that type of birth defect. Women of child-bearing age should be especially careful. The most vulnerable period, according to the paper, is in the first 2-8 weeks of pregnancy. Many people don’t even know they’re pregnant that early on. Furthermore, even the mature placenta is permeable to glyphosate. After 2.5 hours of perfusion, 15% of it crosses over. The actual article, which we read elsewhere describes some of the birth defects: microcephaly (tiny head); microphthalmia (tiny undeveloped eyes); impairment of hindbrain development; cyclopia (also called cyclocephaly – a single eye in the middle of the forehead, like the picture here); and neural tube defects. These are quite devastating. Many fetuses do not come to term, and many babies with these conditions die within hours or days. There’s some evidence that glyphosate interferes with male reproduction, too. A 2014 article published in Science in Society in the UK, entitled “Glyphosate/ Roundup and Human Male Infertility” links glyphosate to falling sperm counts and lowered testosterone levels. National Institutes of Health published a paper in August 2000 that indicated Roundup interfered with reproductive hormones in rats. Other research has implicated glyphosate in other risk factors, particularly since it can disrupt gut bacteria in humans. 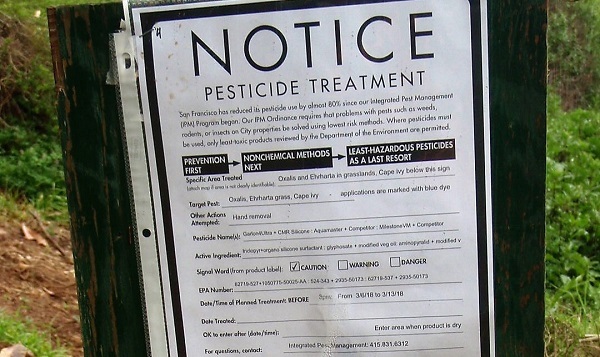 We wrote about that here: Pesticides and Cancer, Glyphosate and Gut Bugs. It’s very dangerous to frogs and other amphibians, and quite dangerous to fish. It damages the soil. How? It binds to the soil, and acts as a “chelating agent” – trapping elements like magnesium that plants need to grow and thus impoverishing the soil. Research also indicates it kills beneficial soil fungi while allowing dangerous ones to grow. There’s a good article about that on the Million Trees website: Gyphosate (AKA Roundup) is damaging the soil that discusses a New York Times article on the subject. Most of SFRPD has continued to decrease use of glyphosate in 2017 – except for the Natural Resource Department (NRD, formerly Natural Areas Program – NAP). Here’s the comparison. These graphs are in fluid ounces of active ingredient. The blue section is the use in 2016, and the orange section shows 2017. 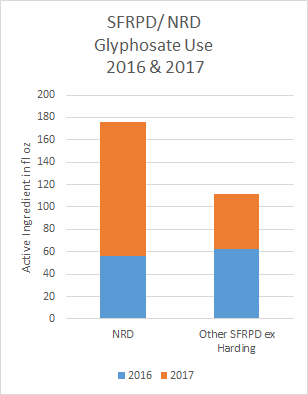 NRD actually used slightly less glyphosate in 2016 than the rest of SFRPD (excluding Harding Golf Course, which is managed under an outside PGA contract). But in 2017, it used nearly 2 1/2 times as much. Bear in mind that NRD accounts for a quarter of our park land in San Francisco. Though we are glad SFRPD has been reducing use, we should be wary: Why Low Dose Pesticides are Still Hazards. Endocrine disruptors can act at very low dilutions, and in their case, the old adage that the “dose makes the poison” is not true.